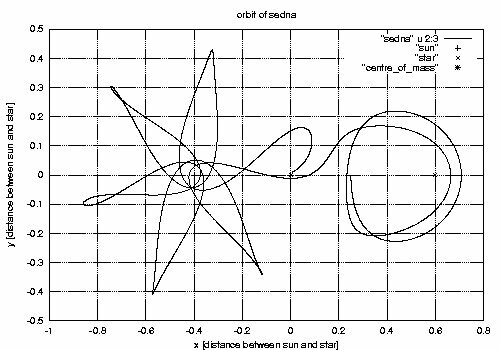 The captured orbit of Sedna after a stellar encounter with a solar-mass star in a weakly hyperbolic orbit around the Sun. The simulation is stopped after 10 orbits of Sedna. The captured orbit of Sedna after an encounter with a 4/6 solar-mass star on a weakly hyperbolic orbit. 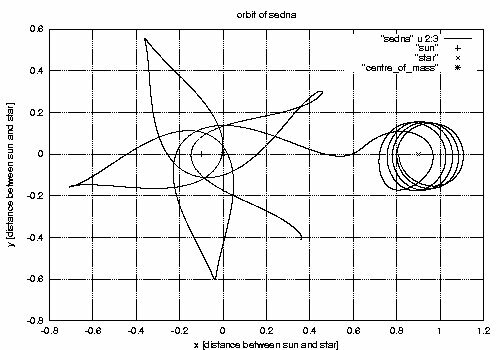 The captured orbit of Sedna after an encounter with a 3/7 solar-mass star on a weakly hyperbolic orbit. The captured orbit of Sedna after an encounter with a 2/8 solar-mass star on a weakly hyperbolic orbit. The captured orbit of Sedna after an encounter with a 1/9 solar-mass star on a weakly hyperbolic orbit. The Kuiper Belt extends from the orbit of Neptune at 30 AU to an abrupt outer edge at about 50 AU from the Sun. Beyond this edge is a sparse population of objects with large orbital eccentricities. Neptune shapes the dynamics of these objects, but the recently discovered planet 2003 VB12 (Sedna) has an eccentric orbit with a perihelion distance, 76 AU, far beyond Neptunes gravitational influence. Although influences from passing stars could have created the Kuiper Belts outer edge and could have scattered objects into large, eccentric orbits, no model currently explains the properties of this object. Sedna is interesting because of its perihelion distance and its huge size (about 1500 km in diameter). An object this large can not have formed by accretion in the tenuous regions of the protoplanetary disk corresponding to its current location. So, it must have formed elsewhere or in another way. In this diploma thesis I have investigated the possibility that Sedna was captured from an outer bounded orbit of a passing star. This possibility depends critically on the geometry of the flyby. Like most stars, the Sun was probably formed in a star cluster and experienced a close encounter with another cluster member. Another possibility would be that the Sun was part of a binary system that broke up due to a close encounter. Encounters with field stars are unlikely. Both, the Sun and the passing star probably had extended planetary disks at the start of their encounter. This thesis shows in analogy to galaxy collisions, that the two stars can exchange a significant amount of outlying material during a flyby, depending on the geometry of the encounter and the properties of the planetary systems. I found out that the Sun could have captured objects after an encounter with a passing star in stable orbits. But this orbits are not comparable to that observed for Sedna. So, the propability that Sedna is a captured object is very much smaller than the assumption that it is a scattered object. The scattering could also have happend because of a passage of a	star. But the most likely possibility after this thesis is that Sedna's orbit arised during the dynamical evolution of the Kuiper Belt. According to this thesis it's possible to capture an object from an orbit of a passing star, although the encounters have very unrealistic parameters. To produce an object with a Sedna-like orbit, stars have to pass the Sun in a distance of about 2000 AU. In addition, Sedna must have had an initially orbit at about 1000 AU from the passing star. But an object like Sedna with its huge size must had been formed much closer in theory. Finally, this is also inconsistent with the apparent formation of 1000 km planets in the larger disks observed around several nearby stars. 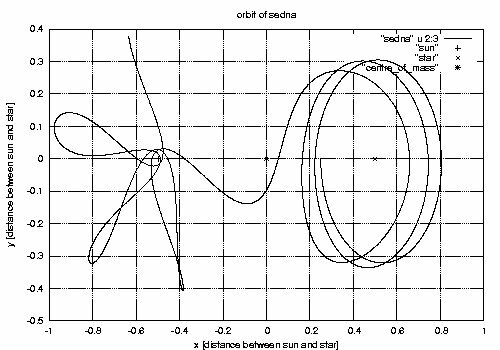 For realistic initial conditions (compare to Kenyon & Bromley 2004) the orbits of the captured objects are not Sedna-like. This is a differing result in comparison to the simulations of Kenyon & Bromley. 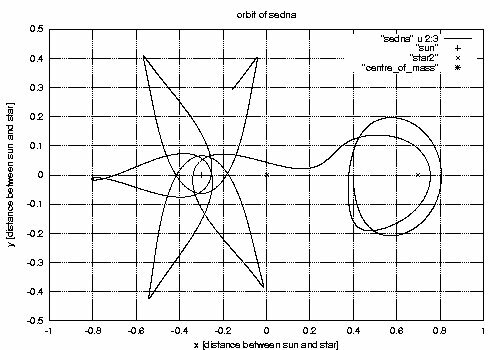 It might be explained by the inclination of the passing star and its phase angle (longitude of perihelion) used in their simulation. Just for simplicity, I restricted myself to two dimensions in this thesis. 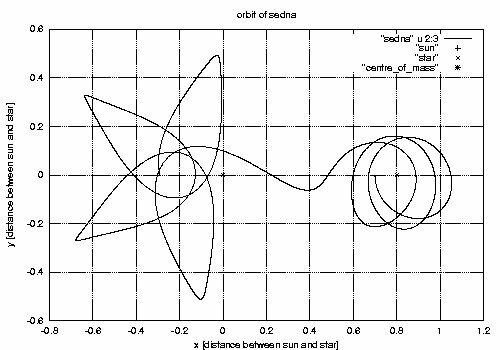 Therefore, the next step should be to analyze the problem in three dimensions for that I can include the inclination and the phase angle of the star's orbit. For binaries a period of 1000 yrs is common with a total lifetime of the system of 10^6 yrs. Therefore, 1000 orbits of the stars are possible. But in most cases a possibly captured object gets astray after a much shorter time. For close binaries, a captured object never goes into a Sedna-like orbit. It's more likely for the object to change over from one star to the other. In July 2005 most of the astronomy journals reported about the discovery of the "10th planet". The following part shows, what the Australian Sky & Telescope Magazine wrote about this event. `July 29, 2005. After 75 years of speculation and false leads, it has finally happened. A team of astronomers using the 48-inch Samuel Oschin Telescope at Palomar Observatory and the 8-meter Gemini North telescope on Mauna Kea, Hawaii, has discovered the largest Kuiper Belt object (KBO) ever. It is bigger than Pluto, the 9th planet. The object, designated 2003 UB313, is currently 97 AU away - more than twice Pluto's average distance from the Sun. This makes it the farthest object ever seen in the solar system. It is a scattered-disk object, meaning that at some point in its history, an encounter with some massive object moved it into its highly inclined (44 degrees) orbit. It's currently glowing at magnitude 18.9 in the constellation Cetus. Its high inclination is the only reason it wasn't discovered years ago; no one was looking for planets so far from the plane of the solar system. Discoverers Michael E. Brown (Caltech), Chad Trujillo (Gemini Observatory), and David Rabinowitz (Yale University) first imaged the object on October 21, 2003, but didn't see it move in the sky until they re imaged the same area 15 months later, on January 8, 2005. Working backward from there, the astronomers have found old images of 2003 UB313 in much earlier surveys, allowing them to determine its orbit accurately. The object turns out to be currently near aphelion (its farthest from the Sun) in a very elliptical orbit. It ranges as close as 38 AU to the Sun in a 557-year orbit. On September 10th 2005, astronomers at the Keck Observatory on Mauna Kea took a look at the 10th planet with a new instrument that allows them to see details as precise as those seen from the Hubble Space Telescope. The images of the 10th planet quickly revealed that it has a faint moon in orbit around it! The discovery is so recent that little is yet known about the moon, but its discovery is important for understanding how moons form provides insight into the history of the solar system. It is quite surprising that three of the four largest objects in the Kuiper belt (2003 UB313, Pluto, and 2003 EL61) all have moons. Such a large fraction of objects with moons suggests that some very common mechanism must be responsible. In the scientific paper describing the discovery Brown et al. (2005) suggest the hypothesis that the moons of 2003 UB313 and 2003 EL61 were both formed from a collision between Kuiper belt objects, much like it is thought the the Earth's moon was formed from a collision between the Earth and an object about the size of Mars. Understanding the orbit of the moon around the planet will help to show if this hypothesis is feasible. Interestingly, many objects in our solar system have moons besides planets. Many quite small asteroids have moons around them, as do about 10\% of the objects in the Kuiper belt (where 2003 UB313 and Pluto reside). So the fact that 2003 UB313 has a moon does not really change the case one way or another for 2003 UB313's claim to planethood. Nonetheless, for some people the existence of the moon makes 2003 UB313 seem a more proper planet. A possible moon of Sedna awaits discovery. That points into the direction that the Kuiper Belt really was once more massive than at present. There seems to exist a huge population of bodies between the Kuiper Belt and the Oort Cloud. The recently discovered are just the tip of the iceberg. Based on the models of the dynamical evolution of the Kuiper Belt and the constraints on its origin. I would propose that Sedna is an indigenous member of the solar system. After finishing my analysis, I would exclude that Sedna is a captured object. The clue about the environment and conditions during the formation of our Solar system is obtained as follows: I can not rule out that the Sun had a binary in the very beginning or a close encounter with a passing star.